Two years ago, Florida resident George Zimmerman was acquitted of the murder of 17 year-old Trayvon Martin, sparking the Black Lives Matter movement and igniting a nation — but what do we have to show for it? The State of the Union for black rights and equality within the nation is grim, and even after two years of protests and dialogue, the victories are few and bittersweet. There has been more progress in the timespan of a month than there has been in a year, and that progress follows the death of nine peaceful churchgoers in Charleston. In return for the loss of nine black lives, the country has finally engaged in a national dialogue about race and racism. In a long-fought battle, opinion on the Confederate flag shifted. In South Carolina, the painful and racist reminder of enslavement and oppression finally came down. But even the monumental achievement of bringing down the Confederate flag is a short lived achievement, as members of the KKK plan to march this week in protest of removing the flag. The group, who identify themselves as a civil rights group, refer to white supremacist Dylann Roof — the murderer of the nine Charleston individuals—as a young warrior. Symbolic gestures — however monumental — won't fix the systemic racism that manifests itself in voting discrimination, incarceration rates, police brutality, poor healthcare, limited education, and more.The realization that black lives matter is only the first step. Actually treating their lives with respect, dignity, and equality appears to be too hard a task for our nation to accomplish. On Tuesday, President Obama spoke to the NAACP before taking to Twitter to discuss the issue of incarceration. While Obama spoke broadly about overpopulated prisons and the desperate need to penal system reform, the underlying issue of incarcerated African-Americans was clear. Of the 2.3 million Americans incarcerated, one million are black. According to the NAACP, African-Americans are incarcerated six times more often than Caucasians. In 2001, the NAACP estimated that one in every six black men are incarcerated, and one of every 100 black women are as well. Despite making up one-fourth of the American population, African-Americans and Hispanics comprise up to 58 percent of the country's prisoners, as of 2008. High incarceration rates aren't the only evidence of deeply entrenched racial inequality either. The Kaiser Family Foundation cites that 27 percent of African-Americans live below the poverty line, compared to the 10 percent of white citizens who do. And black Americans are dying faster and more violently. 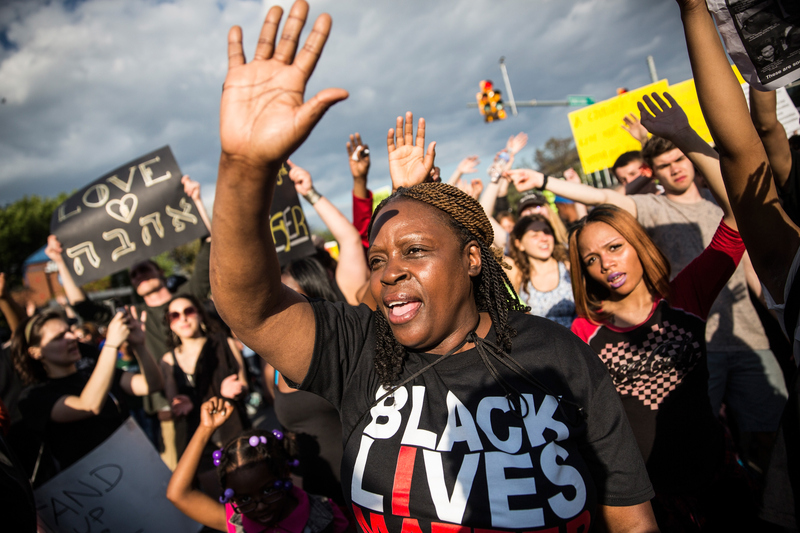 Of the 612 police shootings this year, The Guardian estimates that 164 victims were black. The CDC lists homicide as the number one killer of black men aged 15 to 34, meaning that black youths are 10 times more likely to be murdered than white youths. A popular argument is that if conditions are truly so terrible for African-Americans and other minorities, why not exercise their patriotic duty and vote? Because systemic oppression also plays out in voter discrimination, limiting the ability to underrepresented communities to elect officials. Although the days of Jim Crow laws are gone, voter discrimination still very much exists. A study found that between 1995 and 2014, there were 171 successful voting discrimination lawsuits. These cases primarily took place in states like Texas and Mississippi, and featured subtle, "second-generation" voting barriers, such as photo-ID laws, redrawn districts that limit minority voting blocs, or reduced early voting abilities. As we know, minorities are more likely to live below the poverty line, and therefore may not be able to afford photo IDs, or may work multiple jobs that prevent them from being able to vote during the day. These subtle laws don't seem like much to the rest of the country, but for oppressed minorities, they are a major obstacle in the way of justice and equal representation. And states are still trying to defend voter-ID legislation. The fact that a hashtag had to be created to remind our country of the importance of black lives is frustrating enough, but it is shameful that progress is only being made at the expense of black lives. Despite the activists working tirelessly to further their message and enact change, the only time the nation listens to them is after someone has been killed. In two years we have seen increased awareness and dialogue, but the body count is growing. In two more years maybe we will see the ripple effects and first true changes as a result of these conversations. Hopefully it won't come at the cost of two more years' worth of bodies.